Where else can you find somewhere whose history can be charted over the last thousand years by buildings which still stand: the church of St Mary founded in 1087 which crowns the hill, the school of 1572 and the many Victorian houses which stand on the hill? We know that land here was given to the Kings of Mercia by the Archbishops of Canterbury in the 8th century, a relationship which lasted a full 800 years. It is the school, which became one of our most famous fee-paying schools, which shapes the neat and attractive appearance of the Hill to this day. We catch the train from Baker Street station and arrive at Harrow on the Hill station. Those who meet us there need the Lowlands exit. We then progress up the Hill charting its history, noting the decorative architecture and the old School Houses where boys at the school live. 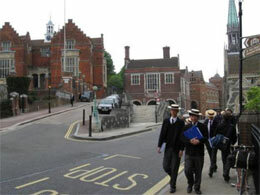 We may see many of the boys themselves in their distinctive uniform scurrying between classes. We hear of the Old Boys – numbering Lord Byron and Winston Churchill amongst them. We enter the Church, mentioned by Shakespeare in Love’s Labour’s Lost, and see where the founder of the school, John Lyons, is buried. This was originally a village complete with village green and a fair where stood the Court of Pie Powder to deal with problems that arose. Here lived Matthew Arnold and Annie Besant and Anthony Trollope. The village maintains its beauty because of the strict rules laid down by the School – here there will be no satellite dishes and no fast food outlets! But there is a wonderful old-fashioned tea shop where you might like to indulge yourself after the walk, before the walk down the hill back to the stations!